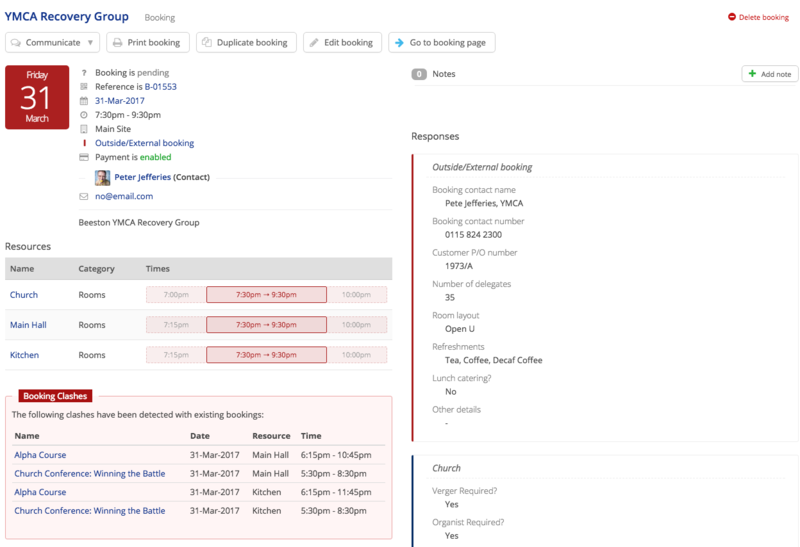 When you go to create a Booking in ChurchSuite we want to make it as clear as possible whether the resources you need are actually available. To make this possible, we have built in clash detection that alerts the User if the resource has already been booked. Obviously there are circumstances where an allocation clash may be wholly appropriate; maybe the clash relates to the Set Up time of one booking and the Set Down of another, or maybe the resource can be used by multiple groups simultaneously (like a kitchen), or maybe there is simply some other arrangement that means it is useful to have both bookings logged on the system even though they are clashing. In these situations ChurchSuite gives you the option to override clashes. When does a clash arise? A Booking clash arises whenever a new booking is made which overlaps in any way with another booking on the system. 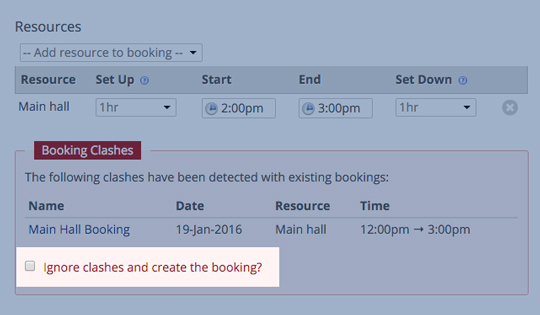 If you go to create a booking which conflicts with another allocation of that resource then ChurchSuite will show you live clash warnings as you're assigning resources, and prevent you from saving that booking and show you the reasons for the clash. From there you have two options. You can either change the details of your booking, by changing the time(s) or the resource(s) and then save. Alternatively, if it is appropriate to your workflow, and you have the correct permissions, you can choose to override the clash and resolve the clash later. 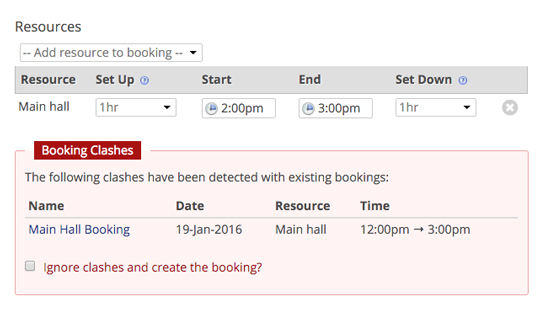 When viewing bookings with clashes, a clash table is clearly shown. Overriding a clash allows you to save the booking in its current form. It does not change the details of the original booking for that resource, but simply treats them as two distinct, overlapping, bookings. To override a clash simply click 'ignore clashes and create the booking' when presented with a Booking Clash notification. To change who has the ability to override clashes, head to the Module Options and change the "Clash Approval" settings. You can choose to restrict the ability to override clashes to just Administrators, or you can choose to extend the ability to Users with Manage permission as well. Admins will always be able to override clashes. To keep track of all the clashes which have been allowed simply head to "Bookings" > "Reports" > "Booking Clashes". This report will display all the relevant bookings contributing to the clash, making it easy for you to click into a booking and delete it, if you feel it has been wrongfully allowed.